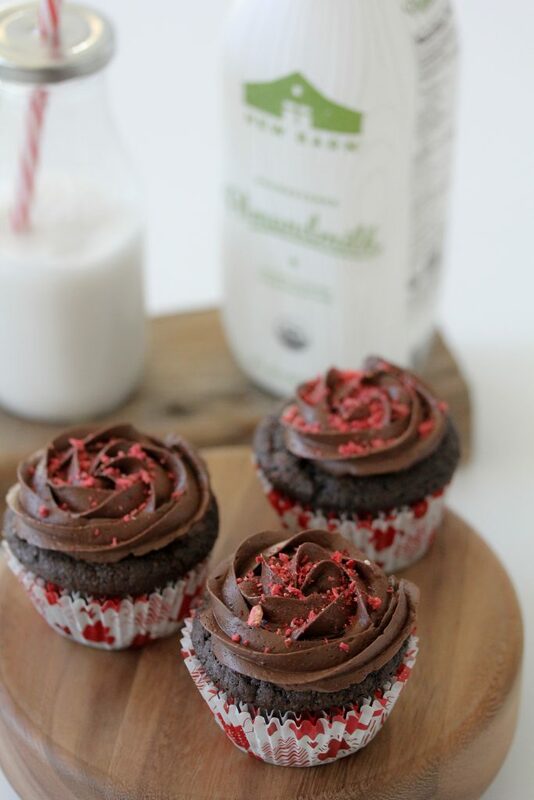 These Grain-Free Strawberry Filled Chocolate Cupcakes are brought to you by The Whole Smiths in collaboration with New Barn Organic Almondmilk and Simple Mills. 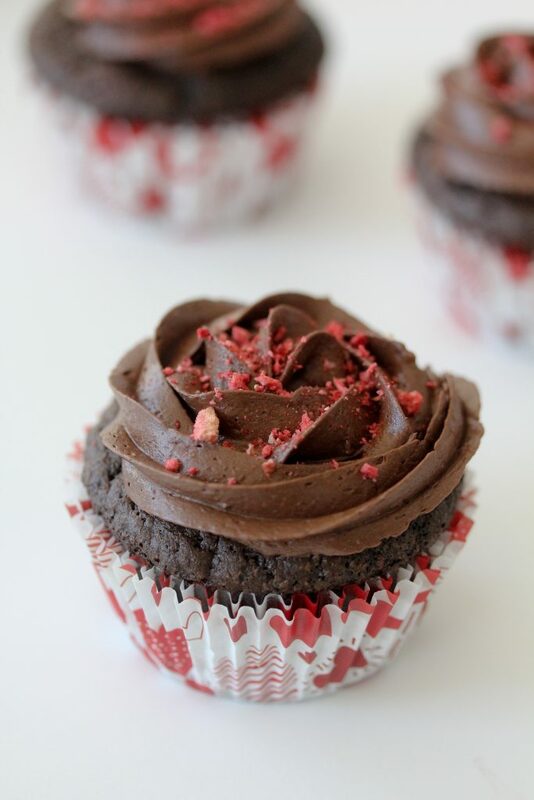 Not only are these cupcakes amazingly easy and delicious but they’re gluten-free and paleo. As you all know by now, I am not a fan of baking. Let me clarify that. 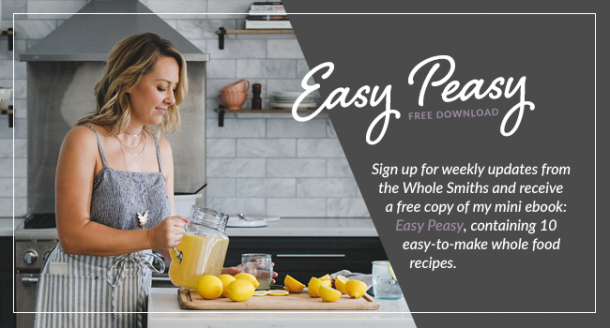 I’m not a fan of baking from scratch, particularly when it comes to baking paleo goods and especially when I’m needing to develop the recipe on my own. Forget it! All of those flours and measurements, it gives me a headache. 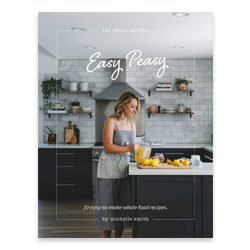 Fortunately, I no longer have that issue as Simple Mills has cracked the code to paleo baking and packaged it up into a nice tidy package for all of us. Cupcakes for all of us! 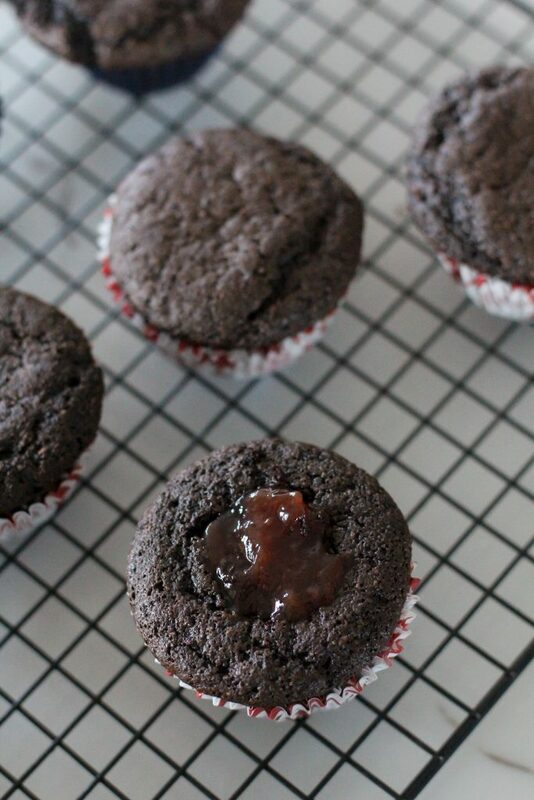 For special occasions in our house like birthdays, Halloween and Valentine’s Day a sweet treat like a paleo chocolate cupcake is just about 20 minutes away. 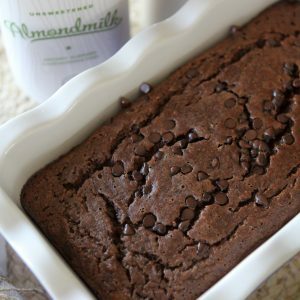 Wash it down with a cold glass of New Barn Almondmilk and it’s a paleo party! Which brings me to my next point. We all know baked goods are even better washed down with a glass of milk but what happens when you no longer drink cows’ milk? Well, I am here to tell you that it is equally delicious with an alternate milk like New Barn’s Organic Almondmilk. In fact, we never have traditional dairy milk in our refrigerator any longer, it’s been 100% replaced with almond milk. So often I’ve shared with you how I use New Barn Organic Almondmilk in recipes but I’ve neglected to say that we just drink it as actual milk as well. Myself, Brad and the kids. We use it in cereal, drink it with dinner you name it. However one would use traditional dairy is now how we use almond milk. The decision to eliminate drinkable dairy came over the last few years as we eliminated more and more dairy from our diets. We still do have small amounts of dairy in our diets but the day to day consumption of dairy at every meal is what we’ve eliminated. So yes, we still have cheese on our pizza when we order it or ice cream when I’m “in a mood” but the daily yogurts at breakfast, cheese on every sandwich or salad and a glass of milk with dinner are long gone. I noticed profound changes in my health and skin since I reduced my dairy intake. For years I struggled with what I deemed allergies, I always felt “snarfley” as Brad put it and would get these allergy attacks that resulted in me sneezing constantly for a day or to leaving my entire face itchy and red. After many trips to the doctor’s office and appointments with allergists I still had no answers. Until I happened to stumble into paleo and it wasn’t until months after that I realized I wasn’t “snarfley” anymore and I hadn’t had an allergy attack in months. It was like magic. And my “terrible skin” cleared up. So yeah. We stopped drinking dairy altogether. In case you’re wondering small doses in a moderate setting are fine. I still have some cheese, ice cream etc. as I mentioned above but I know if I go crazy on it my skin and sinuses won’t be happy. Aaaaand I’ll probably look about 4 months pregnant. In short I’m too vain for dairy these days? But I digress. New Barn Organic Almondmilk has become an amazing choice for our family. Not only are their products organic but they’re free of all of the yucky additives found in so many almond milks and have a higher protein content than others. It’s a no-brainer for us. 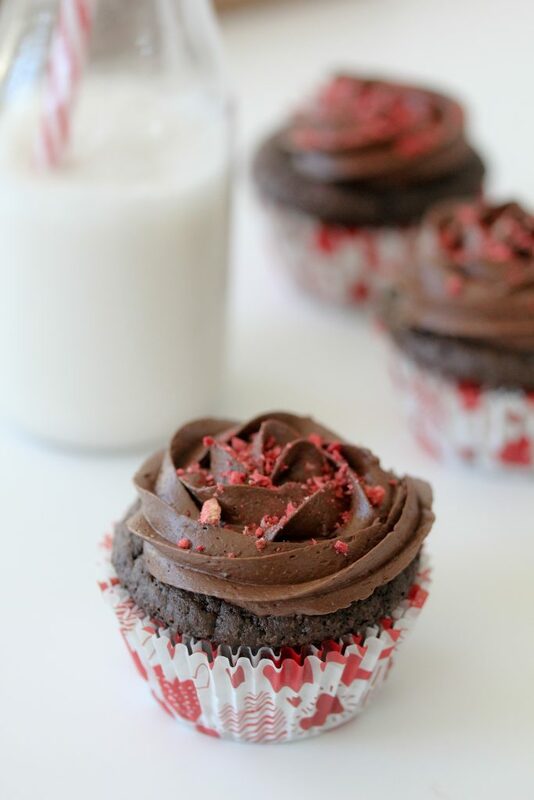 Back to these Grain-Free Strawberry Filled Chocolate Cupcakes. Do you want to know what I love most about these? They seem so fancy. They’re filled, they have a beautiful chocolate rose on top, decorated with some beautiful pink magical dust. But do you want to know the secret? 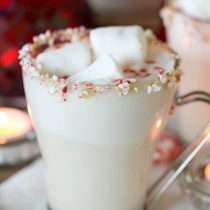 They are SO easy to make! But don’t tell your fiends and family that. 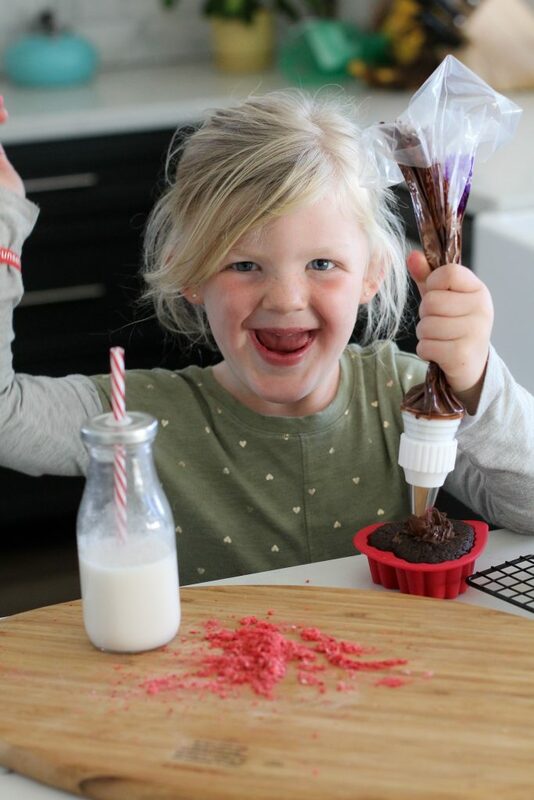 I’m going to let you in on my fancy cupcake hacks. Let’s start with the filling, shall we? Rather than make my own, I used a no-sugar added strawberry preserve. There are a ton on the market and may vary regionally. I did a quick Google search for you and tons popped up. I can typically find no-sugar added preserves at Whole Foods but even Smuckers has one. Once your cupcakes have baked and cooled simply take a small spoon and scoop out a small amount of the center of the cupcake. From there, simply spoon a small amount of the preserves back into the cavity. Boom! You now have a filled cupcake. Feel free to add any flavor you’d like. I’m planning to make Simple Mills’ Banana Muffins later this week and add a small amount of caramel to the centers, frost them and turn them into a cupcake. Now, the chocolate frosting rose. 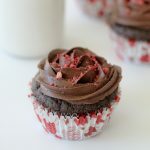 I used Simple Mills chocolate frosting for this. I love that their frosting isn’t loaded with chemicals. Right out of the package the consistency might not be what you’re used to from a packaged frosting as it is firmer particularly in cold weather. However, I empty the contents out into a bowl and microwave it for about 30 seconds to soften it. From there you can spread it or add it to a pasty bag smoothly. Your time may be different or it may not be needed at all so proceed cautiously and don’t over heat it. I am NOT an amazing cake decorator but I have mastered this one easy-to-master skill. I used a Wilton tip #1M decorating tip on a filled pastry bag and started in the center of the cupcake (right over that strawberry preserve patch.). Slowly I pipe the frosting from the center around and out to the sides creating a swirl almost. That’s it! After a few you’ll get the hang of it as there really is no fancy technique or steady hand needed. As far as those dusty magic sprinkles? Well, they are crushed freeze-dried strawberries. That’s it! How’s that for a clean cupcake topper? Your final product will not only visually impress friends and family but I promise this tasty treat will leave their tastebuds happy too. 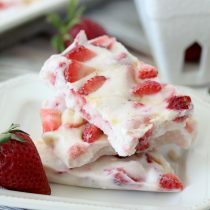 I’m all about keeping things clean an simple in our kitchen and desserts are no exception. Because I’m a proud momma and I can perfectly illustrate just how easy these are to make, let me introduce you to my sidekick. Clearly she’s in heaven. While she’s still mastering the art of the “chocolate rose” she clearly has the sprinkles down along with cupcake eating and almond milk chugging. I hope these cupcakes make an appearance at your next special occasion! 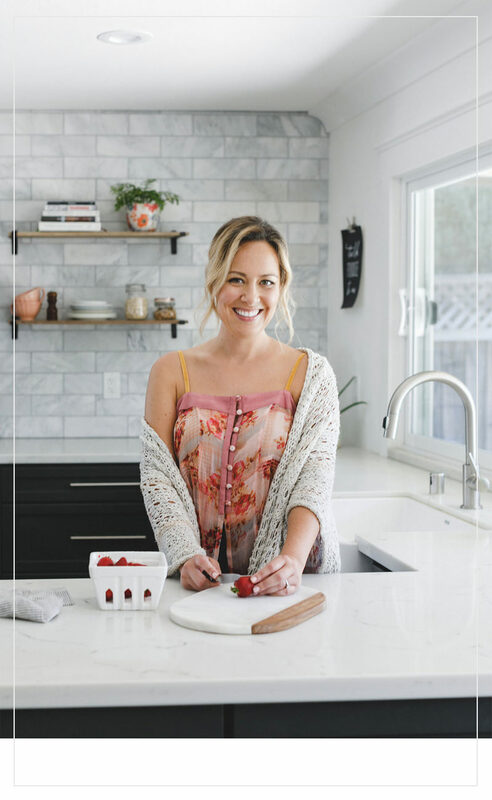 Don’t forget to enjoy some of my other easy-to-make strawberry desserts like my 3-Minute Strawberry Mugcake and my Strawberry Coconut Bon Bons! 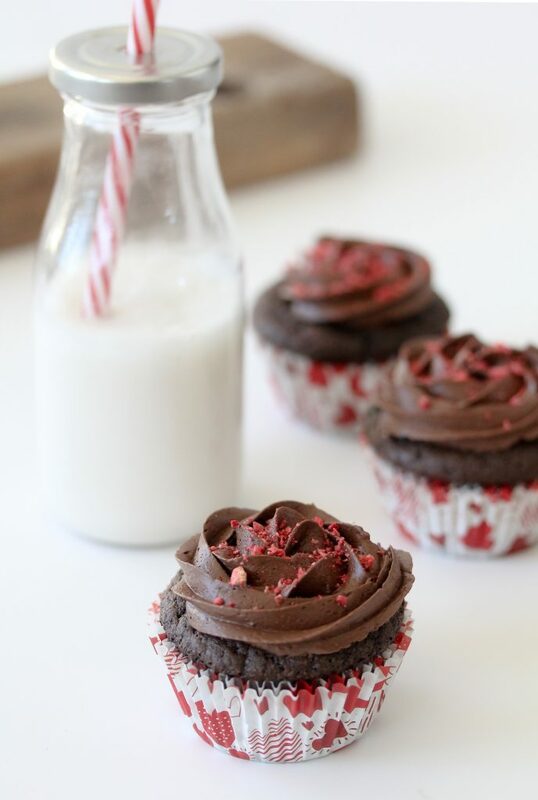 Grain-Free Strawberry Filled Chocolate Cupcakes from The Whole Smiths. Easy-to-make, delicious, gluten-free and paleo. New Barn Almondmilk to wash it all down with! 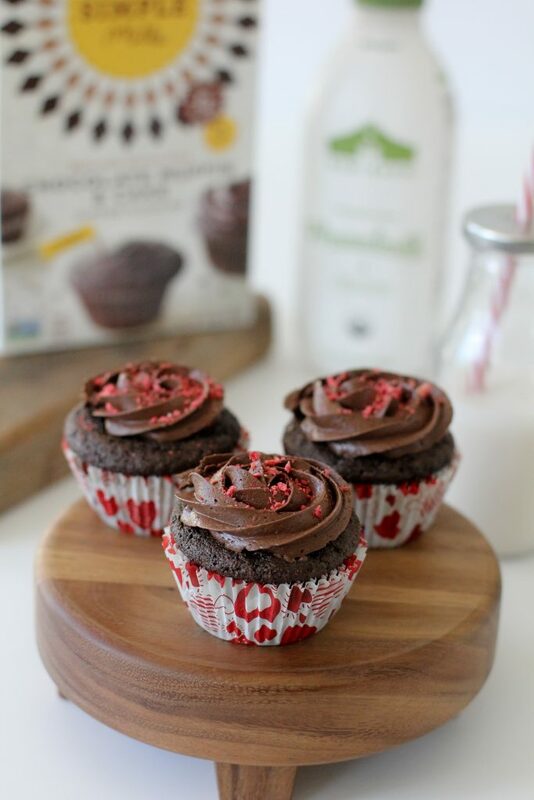 Make the chocolate cupcakes according to package instructions and let the cupcakes cool. 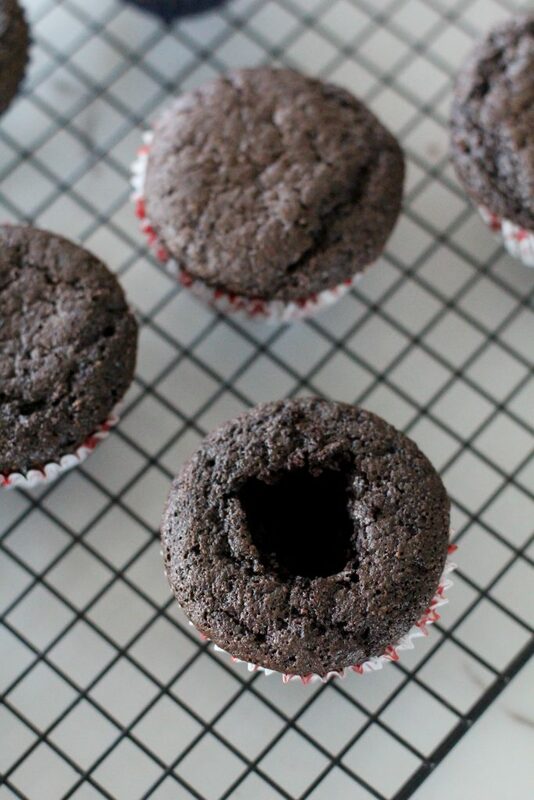 Using a small spoon, scoop out about a teaspoon of the center of the cupcake. Spoon a small amount of the preserves into the cavity of the cupcake to fill it. Frost the cupcakes and sprinkle the tops with the crushed strawberries.